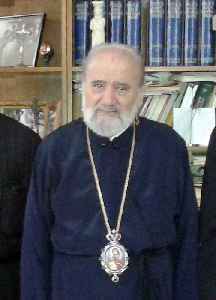 Stylianos Harkianakis was the Greek Orthodox Archbishop of Australia and Primate of the Greek Orthodox Archdiocese of Australia. He served as inaugural and permanent Chairman of the Standing Conference of Canonical Orthodox Churches in Australia and Dean of Saint Andrew's Greek Orthodox Theological College. He was a theologian specialising in ecclesiology and also an award-winning poet.